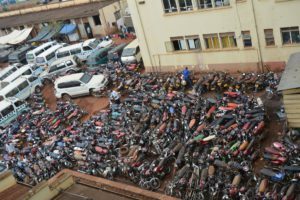 Police in Kampala this morning seized more than 700 bodabodas in a traffic police operation to clamp down on lawless riders. In a statement on the Kampala Metropolitan Police facebook page, police stated that the operation which started on January 26, 2018, targets riders that violate traffic rules and regulations around all the 18 divisions of Kampala Metropolitan Area. Police say the operation follows President Museveni’s condemnation of bad road users especially boda boda cyclists in the city. Traffic officers talk with a driver on Jinja Road. The President, while presiding over the National Resistance Movement (NRM) 32nd Liberation Day celebrations in Arua said the riders’ bad habits scare away foreign investors. According to Kampala Metropolitan Traffic Police Commander Norman Musinga, more emphasis shall be put on major road junctions and roundabouts in Kampala. “Cyclists lacking crash helmets, violating traffic lights, riding along pedestrian paths, carrying more than one passenger and riding while drunk shall be clumped down,” the police statement reads in part. . 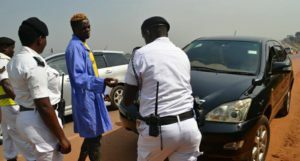 The arrested violators of traffic rules were issued with penalties while others were taken to court for prosecution. Kampala Metropolitan Police Traffic commander Norman Musinga has returned from training with a bang. Gulu boda boda riders vandalise office of rival association.